Live the Dolce Vita and learn Italian in Italy! The land of the Romans, the Medici, spaghetti, and the Fiat 500, Italy is loved around the world for its passionate culture, artistic legacies and delicious home-style cooking. From the mountain trimmed lakes of the north to the rolling hills of Tuscany, the horn-honking streets of Rome to the turquoise seas of Sicily, International House is proud to offer six Study Abroad schools in Italy. For lovers of the great outdoors there's no better place than stunning Como, with its beautiful lake and dramatic scenery. History of art fans, however, will be in their element in Florence, with its world famous architecture and artistic collections. Or for those seeking that picture-perfect Tuscan experience, Arezzo, frozen in time, is a great choice. Further south, the Italian capital offers a fabulous combination of ancient history and the hustle and bustle of a cosmopolitan city. 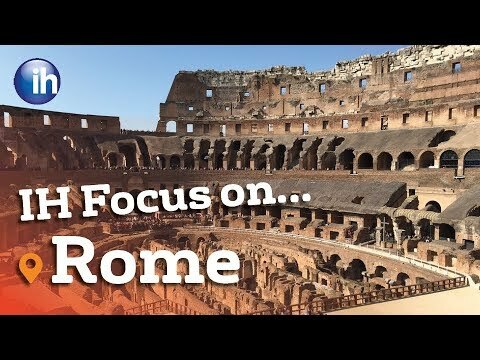 From the awe-inspiring colosseum to the splendour of the Vatican, it's easy to see why all roads lead to Rome. For students looking for an Italian Study Abroad experience with a difference, our Sicilian schools hold the key. With Mt. Etna towering above, Catania has had a long and dramatic history and is a city full of spirit. On the other side of the island, Palermo boasts the chaotic charm of Mediterranean culture from years gone by. Embark on your very own Italian adventure and find out more studying abroad with International House in Italy below.